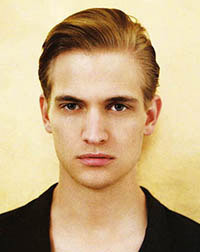 Nick Snider was born in Orlando, Florida, United States, on August 15, 1988, is an American male model. He was discovered at the age of seventeen, at Disney World, by model scout Lana in 2005. He made his catwalk debut for Duckie Brown, Cloak and Marc by Marc Jacobs in New York (2006). Nick is best known for his work with fashion brand Prada, he become the face of Prada in 2007 and renews contract in 2008. He was ranked as the fifth most successful male model in the world on the Forbes list in 2008. Snider's hobbies are computers, going to the beach and McDonald's and listening to music. WWD Law of the Jungle, i-D Magazine, GQ Italia Casting After Party, Man About Town The Collections Bottega Veneta, Cream, L’Uomo Vogue, V Man, Details, 10 Man magazine. Prada, H&M, Ermenegildo Zegna and Lane Crawford. Walked runway for Prada, Marni and Emanuel Ungaro. Represented by agencies New York VNY Model Management, Paris New Madison and Hamburg SPIN Model Management. I did not want to be sitting behind a desk. I like to meet Will Ferrell, because he is the funniest. I would like to own a chain of at least 10 McDonald restaurants.